Like so many other foodie hot spots, this one has been on my list for quite some time! After a great gym sesh, I was ready for something to satisfy my hunger and it was about time we got to Matcha Mylkbar. 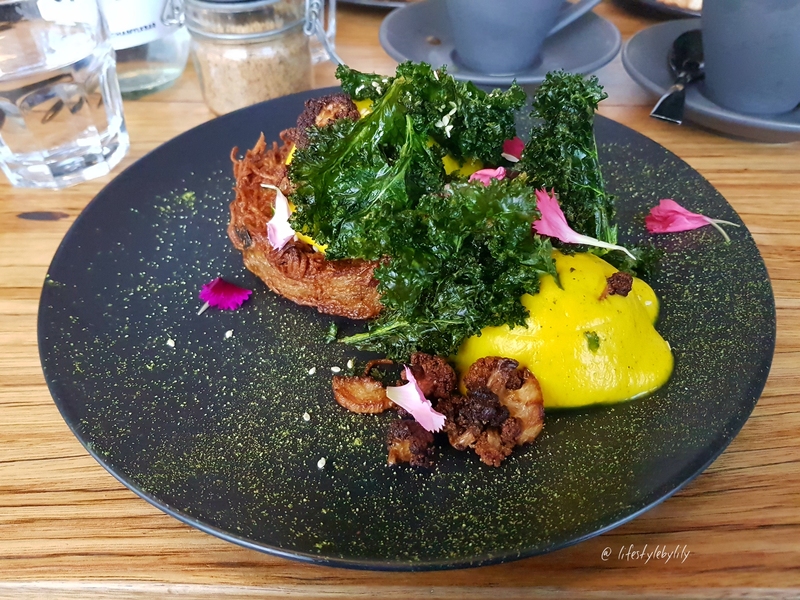 This spot satisfies the healthy and non healthy vegans and people like myself who like to have a vegan meal that is little different to an acaci bowl or tofu. The thing that drew my interest the most is the ‘fake eggs’ reputation. We grabbed a spot by the window and sat down to our menus. Mr. B wanted ine of everything in the menu and I was surprised by the variety of things I wanted to try. I went for the Two Poached Vegan Egg ($20) and Mr. B went for the Soy Chicken Burger + ‘egg’ ($23). 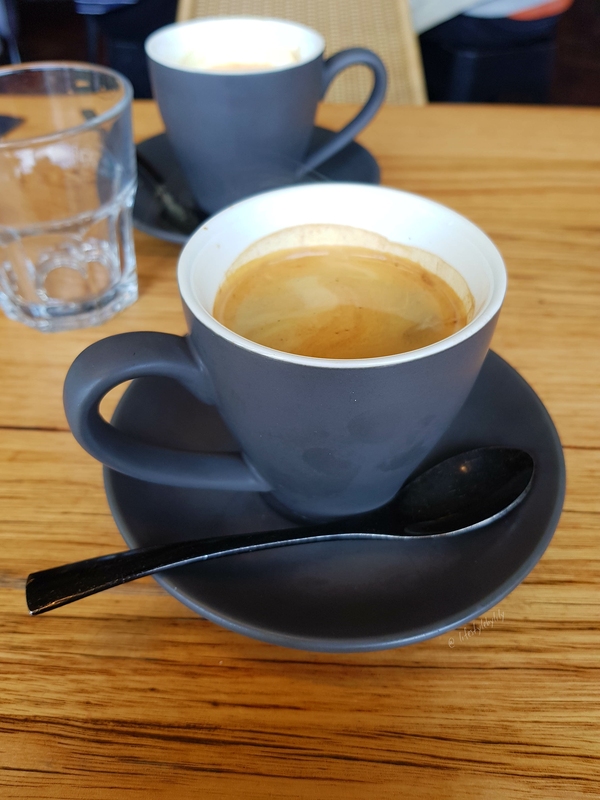 We also ordered a Long Black ($4.50) each and I had mine without milk as I am trying to get out of that habit. How interesting does this dish look! 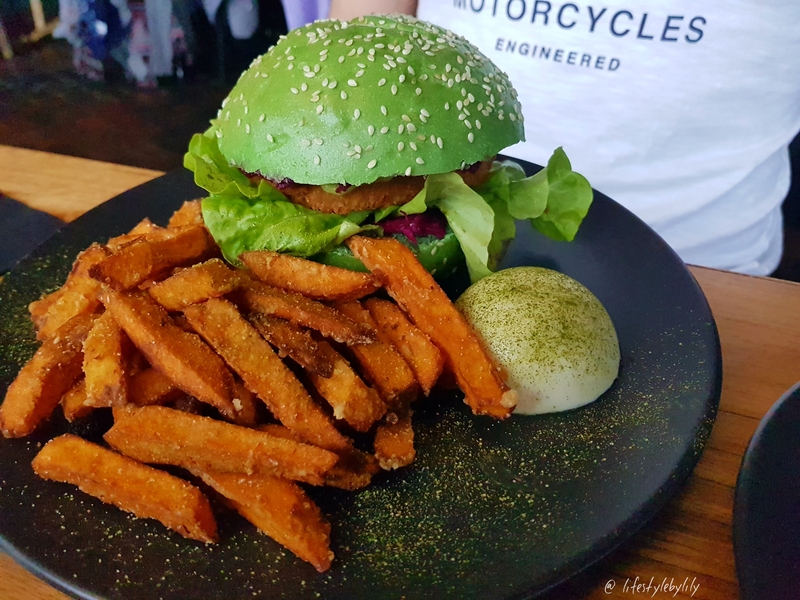 Mr. B said that it was the best vegan burger he has ever had, quite the statement! The sweet potato fries were divine and perfectly crunchy. The white dome beside the burger is the ‘egg’. We could not figure out what it was made from but it satisfied Mr. B’s egg craving. My dish looked equally as tasty. My fritter was packed with flavour and a decent size. I had two ‘eggs’ on my dish and the only criticism is that the ‘yolk’ tasted very like the sauce covering it and I got a little sick of it. Personally, if I got it again, I would order the sauce o the side so I could use as much or little of it as I wanted. The kale on top of the dish was an excellent accompaniment and added some extra crunch to the dish. Overall, I enjoyed it. Before we left, we got two raw slices to take away…simply delicious! Any recommendations for vegan breakfast dates?